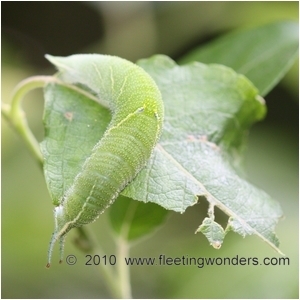 Lucky enough to spot this caterpillar of Purple Emperor (Apatura iris) in the woodlands (Franche-Comté, June 2010). 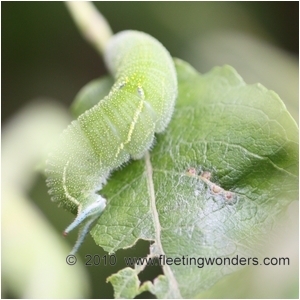 The main foodplant to check when searching for this caterpillar is Goat Willow (Salix caprea) which usually grows on forest edges and along paths. 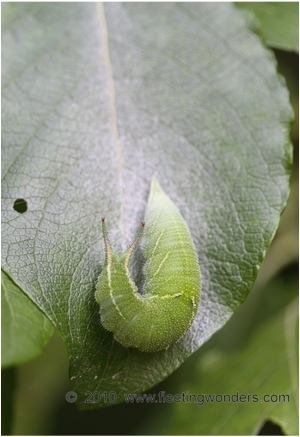 Therefore the Purple Emperor survives only in habitats that remain untouched or well preserved. 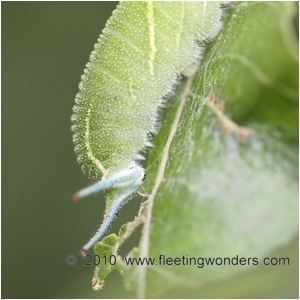 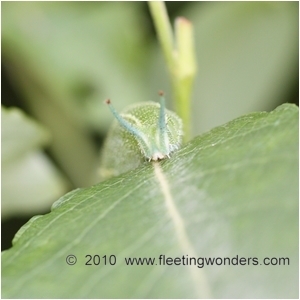 The caterpillar sets a network of silk on the upperside of a leaf then spends most of its time on it, motionless. 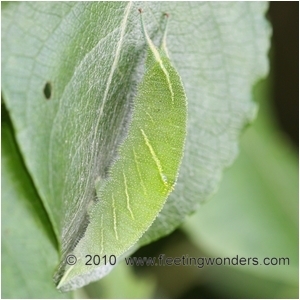 This silken sheet is visible on the picture on the right and covers also the main vein of the leaf. 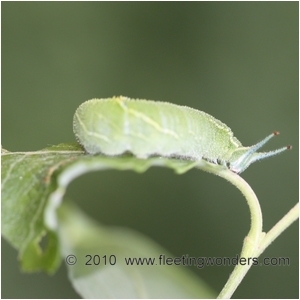 As the caterpillar is somewhat heavy, this silk may help it stay on its support whose surface would be totally smooth otherwise. 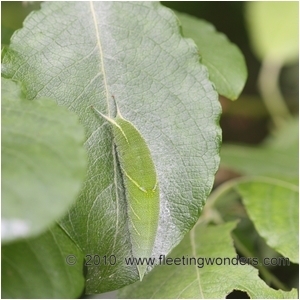 The colour of the caterpillar and its patterns are very similar to the venation of the leaf, making it hard to spot for a predator. 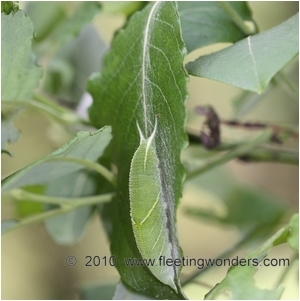 From time to time the Emperor leaves its resting leaf to reach another one nearby which is eaten little by little. 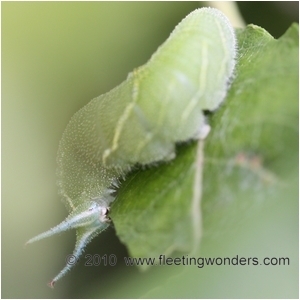 When shifting to another place, it seems that the larva sticks a string of silk on its way. 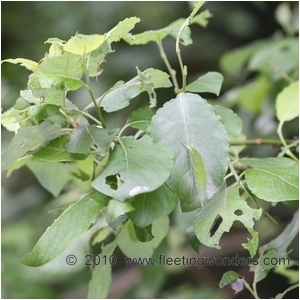 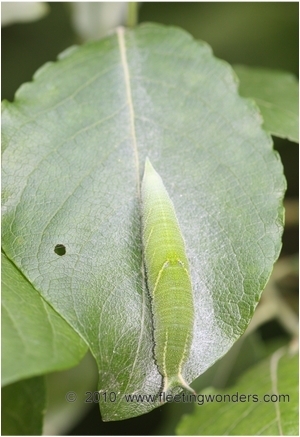 The two pictures just on the left show that some silk had been set up on the leaf by the caterpillar previously, indicating that the same leaf is used several times at intervals as a dining area. 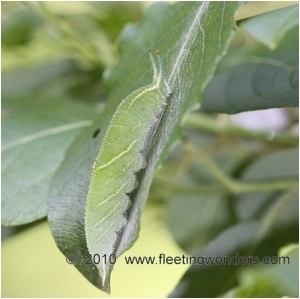 After feeding, the caterpillar moves back heading straight to its resting leaf ; the silken string previously set up may be used as a path, which can be helpful to find the way back.